Israeli director Ari Folman unveils 1st authorized Anne Frank graphic novel. In a bid to preserve interest in the Holocaust by future generations, the Anne Frank Foundation unveiled the first authorized graphic novel based on the diary that the Germany-born teenage victim of the genocide penned in hiding from the Nazis. The 148-page adaptation is scheduled to be published on Sept. 18 in France and in some 40 languages worldwide. It was presented on Thursday to journalists in Paris by the book’s illustrator, David Polonsky and its screenwriter, Ari Folman. Both Polonsky and Folman are from Israel. Folman, who is also is a film director, is working on the first full-length authorized animation film based on the graphic novel. The graphic novel, which was developed in cooperation with the Anne Frank Foundation, contains colorful illustrations both of realities described in the book, including Anne’s difficult relationship with her mother and sister, and her dreams and fantasies. The Anne Frank Foundation was entrusted by Anne Frank’s father, Otto, with preserving her memory. One full-page drawing, based on Anne Frank’s writing about wanting to become a journalist, shows an older Anne sitting at her desk, with framed newspapers in the background, including a Life magazine cover featuring a picture of her. “I’m worried we’re coming to an era where there won’t be Holocaust survivors on Earth, no living witnesses to tell the story,” said Folman, who was born to Holocaust survivors whom he said told him and his sister “way, way too many” horrible stories from the genocide. As survivors disappear, “the entire story of the Holocaust risks becoming something ancient so it’s essential to find ways to preserve” interest in the Holocaust, he said during a Q&A in Paris. 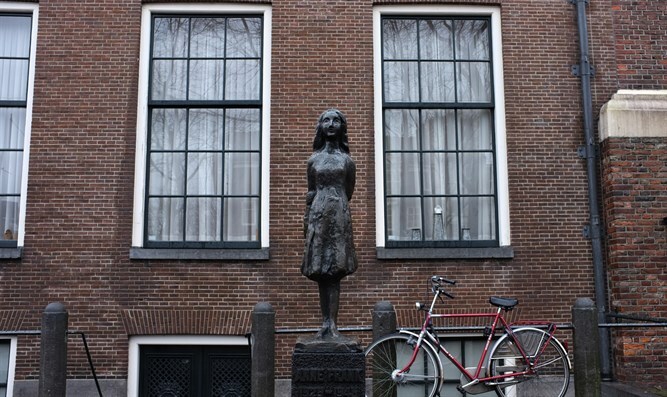 Anne Frank, her sister and parents and several other Jews were deported in 1944 to be murdered following a raid by Nazi soldiers on the "secret annex" where they lived in hiding with help from the Dutch resistance. Anne Frank died seven months later in a concentration camp. Her mother and sister also died. Only Otto Frank survived. After the war, Otto edited his younger daughter’s writings and had the manuscript published in 1947. Folman and Polonsky initially turned down the offer, they said, because artistically they doubted their ability to make a contribution that would stand out from the many films, books, theater shows, operas and musicals that have been produced over the story of Frank. There has been “too much done around the story,” Folman said. Anne Frank is perhaps the world’s most famous Holocaust survivor following the publication in dozens of languages of her diary since 1947. Folman reconsidered after speaking to his mother, whom she said is now “living with the goal of seeing the premiere” of the film he is making about Anne Frank. Since the 1940s, many authorized and unauthorized adaptations on the Anne Frank story have been created in various media. In Japan alone, the Anne Frank story has been the subject of several comic books – graphic novels in the Japanese manga style. But these publications were not authorized by the Anne Frank Foundation for historical accuracy corresponding to Anne Frank’s actual writings. The film, Folman told JTA, will treat also the last “horrendous” seven months in Anne Frank’s life, despite the absence of material on this period written by her. “We used other historical sources to address this part of her life. It was a condition of mine to work on this,” he said.